Minister of Education, Hon. Rev. Ronald Thwaites (left) addresses the opening ceremony of the Cornwall Regional Hospital (CRH) Child Protection Committee Child Month Exhibition at the facility in Montego Bay on Thursday, May 15. The theme for the annual exhibition was ‘Parents take responsibility: Break the cycle’. 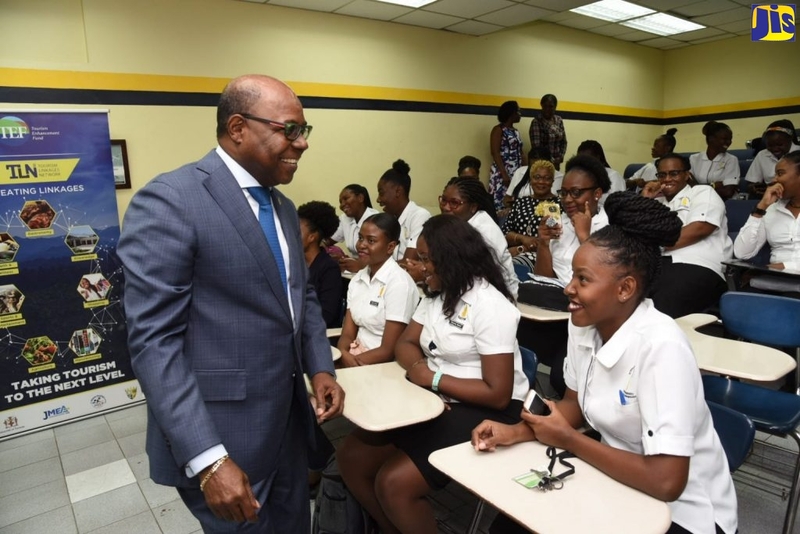 Starting this September the Ministry of Education will be providing free breakfast daily to 138,000 children, or 70 per cent of the cohort in early childhood institutions, across the island. The remaining 30 per cent will have the option of making a contribution or paying in full for their breakfasts and lunches. Food for the programme will be provided by Nutrition Products Limited as well as the schools, Minister of Education Hon. Rev. Ronald informed. He noted that “the cheese trix and bags juice culture simply won’t cut it. We need to give our children a proper nutrition especially at the early childhood level”. He said the Government is allocating $1.05 billion to the School Feeding Programme after findings of a pilot breakfast programme last year by the School Feeding Unit of the Ministry, showed that 40 per cent of children were in need of constant supplement. The programme found that another 30 per cent sometimes go hungry. Minister Thwaites was speaking at the opening ceremony of the Cornwall Regional Hospital (CRH) Child Protection Committee Child Month Exhibition at the facility in Montego Bay on Thursday, May 15. The theme for the annual exhibition was ‘Parents take responsibility: Break the cycle’. The Education Minister said all the local studies point to inadequate and inappropriate nutrition as being a significant cause of poor brain and personality development. Meanwhile, he endorsed the efforts of the Committee in designing and implementing training programmes for parents and guardians of victims. The Minister pointed to the need for inter-ministerial collaboration to best catch early signs of personality and emotional dysfunction in victims of abuse or neglect, before they enter the school system. He noted that with the help of the United Nations Children’s Fund (UNICEF) and the United States Agency for International Development (USAID), the Ministry has established more than 60 parent places during the 2013/2014 financial year, and is on track to set up an additional 30 at the primary level. A parent place is also to be located at the Cornwall Regional Hospital. One of the objectives of the Committee is to identify and protect abused or neglected children in Montego Bay and its environs. Committee Chairman, Dr Garfield Badal reported that in 2013 more than 200 students and 50 parents participated in the Committee’s outreach programme, benefitting from counselling and interventions.